What matters when learning to cope with stress is realising that most people can deal with the everyday stresses of life such as traffic jams, being late for work, the alarm clock not going off, not being able to find your work documents, family problems and so forth. Some stress is good for us, but the bad stress is a real issue. We need to learn how to cope and deal with it as best we can. Learn to know what’s right and what works for us, for you. What matters is realising stress can become a major problem when it builds up over a period of time or you let lots of issues pile up so that it becomes difficult to deal with and you begin to suffer anxiety. Recognising this build up is key in addressing or solving stress issues. Don’t let so many things build up so that you can’t see the wood for the trees. What matters is that we learn to develop healthy coping mechanisms that work for us as individuals. Long periods of increased stress can lead to poor energy, tiredness, lack of focus, ill health, severe lack of enthusiasm, poor concentration and heightened anxiety. What matters is that we learn to recognise when we are feeling stressed. What matters is that we take some quiet time each day to relax and stay away from stressful situations or distractions. Listen to music. Make playlists that can help reduce heart rate and blood pressure and give us a feeling of calm. You may like this book to help you, it’s not just for the classroom, it’s a book for you too. Take some quiet time to sit on your own or with someone else. If you’re with someone else you don’t need to speak or have a conversation, it’s about ‘just being’. Take a walk through the countryside or along a beach, breathe the fresh air from the top of a hill or mountain, listen to the natural sounds around you and be aware of the freedom and space you can create for yourself. This will help you feel like you have space in your mind too. What matters when there are household issues that cause you stress is for you to think about making a list of jobs or things you need to do. Put the most important or challenging job first, and as you carry out these jobs tick them off the list and you will see that progress and taking small steps of action helps. This releases the stress pressure. Try and declutter papers, books, magazines, washing, mail or dishes so that you can ‘see’ space. This visual space will help you with decluttering your mind. It will give you mind space. What matters is that you try and stay away from too much alcohol, caffeine, sugary drinks (including fruit juices as they have a tremendous amount of hidden sugars) and drink plenty or water. I am quite partial to the sparkling kind myself! What matters is that you take some regular exercise. You don’t need to join a gym, you can exercise anywhere! A few steps up and down stairs (if you have stairs of course!) or walking around the house, bending and stretching, dancing (when no one’s looking!) or dance away when everyone is looking. It may get you and those around you laughing which is a very good way of releasing and relieving stress. Get a hula hoop and do some #hulahula exercise. If it keeps falling to the floor pick it up again and keep going. Once you achieve a few hula moves you’ll feel a sense of achievement and confidence that you can do it. Self-esteem and confidence builds our resilience in dealing with difficult situations. Do some simple Yoga, there’s also Laughing Yoga you can do too! Whatever you do, try and take 10 minutes each day to get some exercise. If you have a Fitbit or Apple Watch check the steps, calories, moves etc and that will also help you to feel good about yourself, plus think of the health benefits. What matters is that you get into a good sleep pattern. Sleep is wonderful. Sleep can be the best form of stress medicine especially if you train your body to rest at regular times. Little ‘cat naps’ are also good to refocus your mind and body too. What matters is that we try not to skip meals or over eat. Little and often is better than skipping meals because once you start to eat you’ll want to eat more. A large meal will make you feel bloated and uncomfortable, and then you’ll feel guilty and become stressed about over indulging. Eat as healthily as you can. Have small treats at the weekend so you can look forward to it. See the threats as a goal to get you through the week. Depriving yourself will only create more stress. What matters is that you learn to say no. You need to put yourself first. If you are feeling under increased stress it’s very important you prioritise your own wellbeing before you can help or support others. What matters is that you don’t allow family, friends or professionals to pressurise you into situations or doing jobs. Don’t do something that you don’t want to do to simply please others. It’s perfectly acceptable to say that you need time for and by yourself. What matters is that you don’t expect too much from yourself. Be kind to yourself rather than punishing or torturing your thinking cycle if you feel you’re not coping well. It’s Ok to not feel or be Ok. Take time when YOU need it. We all need to do that from time to time. What matters is trying to keep a positive mindset. It’s not always as easy as we think, but when you get destructive or mind-boggling thoughts it can bring your mood level down. In turn this affects your cognitive process and the way in which you can deal with your emotions. Negative thinking will only add to the stress. Celebrate at least 3 good things you’ve achieved or done over a period of time. This can be in an hour, day or a week. It depends how much control you want in order to make yourself feel better and celebrate your achievements. SupportLine Telephone Helpline: 01708 765200, email info@supportline.org.uk – emotional support and information on counsellors and support groups throughout UK. To provide information about all aspects of stress management. Also run conferences and workshops. 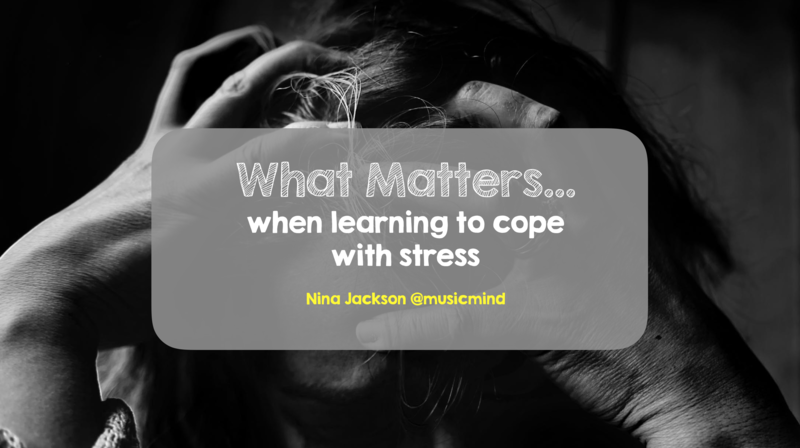 What matters is that you learn to know when you have your ‘Stress Head On’ and you develop personal coping mechanisms for getting your ‘Stress Head Off’. I have my own stress strategies, I’d be interested to know yours. What matters is that you don’t expect too much from yourself. Be kind to yourself rather than punishing or torturing your thinking cycle if you feel you’re not coping well. It’s Ok to not feel or be Ok. Take time when YOU need it. What matters? YOU matter. Never forget that. I’d love to know your thoughts or your coping mechanisms, so do get in touch if you’d like a helping hand to get you through the tough times.